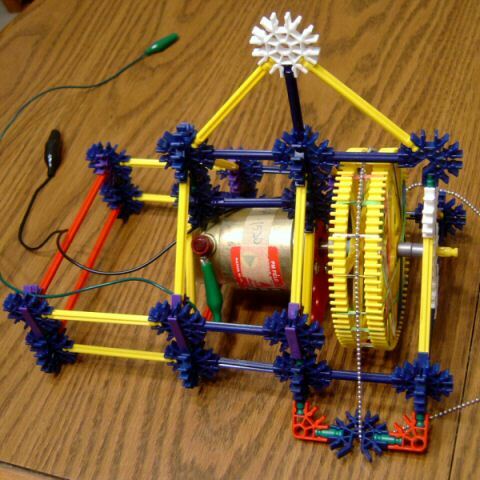 How can you build a linear momentum machine or Lariat Chain from an old 12v dc motor and K'nex? Here are pictures of my momentum machine. Hopefully the details are evident from the pictures. Send me e-mail if you need another picture. Parts and construction methods are not critical. The dc motor was liberated from an old dot-matrix printer. It is a 12v servo motor, connected directly to a variable dc power supply. A vee-shaped guide piece is important to keep the incoming chain centered on the pulley. We had lots of problems keeping it running until we added a guide. 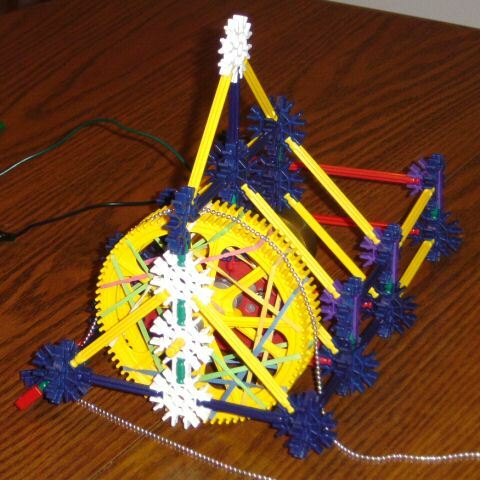 The shaft coupling happens to to accept a K'nex rod, which forms the axle of a 5-inch diameter K'nex gear wheel. Two of these gear wheels are joined loosely by rubber bands. The chain rides on the rubber bands in the middle of this pulley. 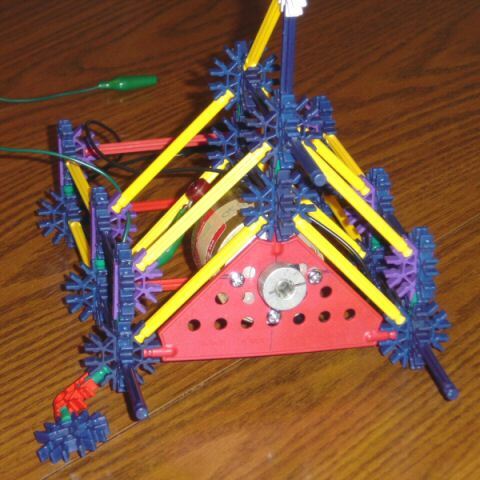 My first model used a K'nex chain riding directly on this pulley. It worked great. I drilled a triangle piece to hold the motor. The positioning was carefully chosen so the motor shaft lines up with the far end of the axle.